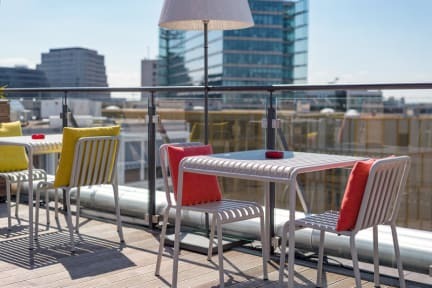 aletto Hotel Kudamm i Berlin, Tyskland : Boka nu! aletto Kudamm – in the heart of City West. We are located between Amerika Haus and Theater des Westens. Zoologische Garten, Kurfürstendamm, Kaiser Wilhelm Memorial Church and KaDeWe are within just a few minutes’ walking distance. We are also close to Zoologischer Garten railway station, offering the ideal transport connections for discovering the lively capital and its many attractions. The private rooms in the hotel accommodate one to six guests. These rooms are equipped with many amenities such as individually controlled air conditioning, flat-screen TV with satellite reception and radio, and Wi-Fi with Internet access. In addition, bathrooms with a shower, toilet, hairdryer and floor heating offer the comfort you need during your stay in the city. The backpacker’s quarters have five dorms for eight to ten guests. It includes lockers, two separate bathrooms with spacious shower facilities, men’s and women’s toilets, and laundry facilities with washing machines and dryers. The common kitchen area has everything you need for preparing meals, and you can find additional everyday items in the supermarket around the corner. For a relaxing and enjoyable start to your day, you can also reserve our delicious all-you-can-eat breakfast buffet for €8.50. aletto Kudamm also offers many leisure activities. Inside we have a billiard table and many games available to our guests. When weather permits, guests can take advantage of our basketball court, soccer field (five-a-side), table tennis tables and petanque court. We also provide free unlimited Wi-Fi throughout the hotel so you can surf the Internet or chat with our many international guests and meet new people over tasty snacks and drinks at the bar or in the hotel garden. For a perfect end to the day, you can also enjoy the 360° panoramic view over Berlin from our rooftop terrace. Good place if you are looking for a short and cheap stay, there were 8 beds in shared room and people coming in and out at night, but if you don’t mind the sound than it’s no problem. Facility clean and good, staff fiendly and helpful. I recommend this hostel.